I don't mind travelling alone, but that’s just me. Of course it’s not my preference to travel alone nor do I really encourage any girl to travel by herself; however, if given the opportunity to experience something really great, I would encourage anyone and everyone to say “yes” regardless of who or who’s not by your side. I don't encourage reckless or dangerous behavior, but there are worse things in life than traveling and being alone in a beautiful city. However, there are few things worse than regret. Be open to where life can take you even if you're flying solo. 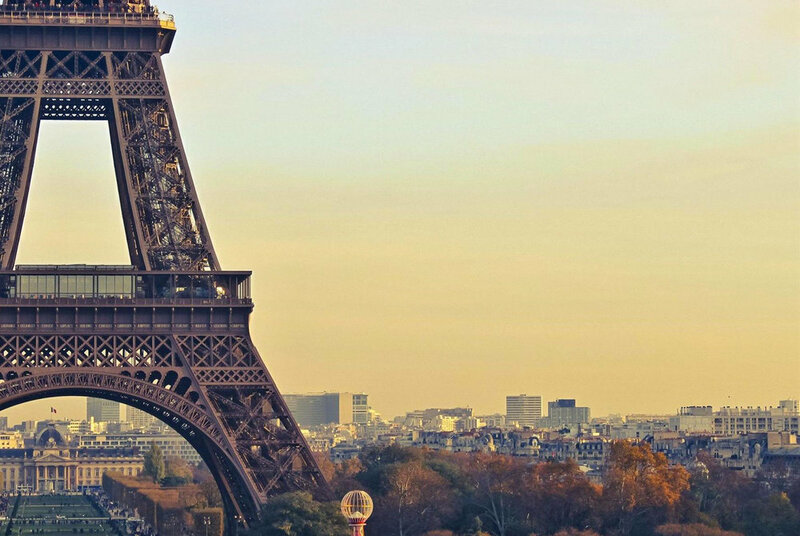 Paris has forever been known as one of the most romantic place on Earth. Countless times do we hear of newlyweds returning from their honeymoon in Paris, see pictures of kisses exchanged at the foot of the Eiffel Tower, or lovers embracing in Parisian streets. Without a doubt, Paris is a top destination for a couples, so how can one visit Paris and skip all the romance? After visiting my cousin in London, I went to Paris on my way to Spain. Unfortunately, I never made it to Spain because life changed, but I ended up staying in Paris by myself for a week and a half. The following are some tips and tricks for your nonromantic visit to Paris alone (or with platonic companions) and on a budget. I got a metro pass since I was staying in Neuilly-sur-Seine a western suburb of Paris. Even if you decide not to get a Metro pass, get comfortable with the idea that you'll be riding the metro. The public transportation system in Paris is extremely easy and fast. Side Tip: I don't recommend taxis in Paris as most of the city is accessible by metro or foot, not all taxi drivers will speak English, you may get overcharged, and if you're a girl traveling alone you may get Taken. Seriously. In the words of one of my favorite sports brands, Just Do It. This is my number one tip because the Paris Museum Pass allows you unlimited access to over 60 museums and monuments in and around Paris (i.e. Château de Versailles) for a flat price. The pass is available for 2 days, 4 days, or 6 days (I chose 6 days since I was in Paris for over a week). If you’re in Paris for a weekend get the 2 day pass for 39 euros (roughly $50 USD). Not only can you visit any museum multiple times, but you also get to skip the horrible tourist queues. If you’re travelling alone, this will save you from having to watch couples coo at each other and, more importantly, save you hours from standing in line allowing you to maximize your time in this beautiful city. For example, Musée du Louvre can easily have a 3 hour wait. Ask yourself, “How do I want to spend my time?” Honestly, I went to the Louvre, entered right away, ventured around, exited for lunch, and re-entered the Louvre before some people I saw in queue the first time even got to enter. Just do it. And you’re welcome. Side Tip: If you have the time or flexibility, I highly recommend going to Château de Versailles. It's outside of Paris, so you need to take the metro there. The museum pass works there, and will really save you a lot of time when you get to skip the queue. In the morning, start at Musée d'Orsay by Rue de la Légion d'Honneur because the Metro RER C is right by this OR start at Musée de l’Orangerie if you’re taking Metro M1, M8, or M12 (stop is Concord). Personally, Musée d'Orsay is my favorite museum but Musée de l’Orangerie is a must and a quick visit to see Monet’s Les Nymphéas. After Musée d'Orsay and Musée de l’Orangerie, stroll through Jardin des Tuileries (Tuileries Garden). Take your time, get a coffee or snack, and breathe it in. The Garden Tuileries is comparably to our Central Park and also very close to Musée du Louvre. On your way to Musée du Louvre, take a quick snapshot by Arc de Triomphe du Carrousel. Beware of pickpockets and con artists here. Finally, enter Musée du Louvre. The Louvre has the famous Mona Lisa and a beautiful Greek and Roman sculpture collection including Venus de Milo; however, Musée d'Orsay has a better impressionism and post-impressionism collection. I’d do a little research and decide how you want to split your time. If anything, remember you can always return to a museum for free and at ease with the Museum Pass. If you’re ambitious, you can also visit Musée Les Arts Décoratifs which is right by the Louvre, although this collection wasn’t very important to me and I spent more time in d'Orsay. Side Tip: Musée de l'Orangerie and Musée du Louvre are closed on Tuesdays. Musée d'Orsay is closed on Thursdays. Musée Les Arts Décoratifs is closed on Mondays. 3. Eat a croissant. And a baguette. This post isn’t meant to review French gastronomy, perhaps I’ll do that at a later time. However during your stay in Paris, you must eat a croissant and a baguette (of course, unless you’re allergic to gluten). Throw your carb free diet out the window, and take my advice. Croissants, baguettes, and all kinds of pastries and baked goods are impeccable in France and will be kind on your budget. I don’t have a particularly bakery to recommend, as they’re all exquisite and I chose spontaneously. Side Tip: Find a boulangerie or pâtisserie with a long line, and get whatever the person in front of you ordered. 1) You’re trying to get through Paris alone, right? 2) What better way to discover France than a nice glass (or bottle) of Bordeaux? It’s only appropriate on so many levels. 5. Carry a good book with you and slow down. I believe in planning logistics like how to get from Point A to Point B, where you’re staying at night, and how to maximize your time. If you’re a female traveler and/or travelling alone, I highly encourage you to do some planning when in a foreign city for your safety; however, I discourage making day itineraries and planning by the minute. This tip doesn’t pertain to just Paris, but nonetheless is important. Carry a good book with you, stop in a café, and read. Breathe… and really breathe. Take everything in and enjoy every minute. Feel alone but don’t feel lonely. Go where you want to go. Eat what you want to eat. Again, be open to where life can take you. After all, c'est la vie. P.S. This post is dedicated to one of my followers. Thank you Sasha.